culture.politics.opinion: Klimt's returned. Now for Vermeer. Another spectacular restitution claim against a major art museum emerged today in Vienna. The family of Jaromir Czernin is claiming the circa 1666 painting The Art of Painting by Jan Vermeer was sold under duress in 1940 and is now illegally in the collection of the Kunsthistorisches Museum. The work would normally be considered priceless. Up to 1940 the painting was in the possession of Jaromir Czernin. He was the brother-in-law of Kurt Schuschnigg, the ill-fated Chancellor of Austria as Nazi Germany annexed its smaller neighbour in 1938. Czernin and his wife were subjected to various forms of harassment by the Nazis and his family now claims he sold the painting to Adolf Hitler under duress. 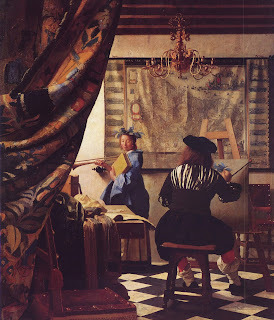 Earlier assessments of the case found that the sale to Hitler was legal and that the post-war transfer of the painting - the biggest ever completed by Vermeer - from Hitler's estate to the Republic of Austria was correct. The case follows on the heels of the famous restitution of a portrait of Adele Bloch-Bauer by Gustav Klimt painted in 1907. This painting was returned to the niece of its pre-war owner after a ten-year international legal battle. It was eventually sold in 2006 for US$135 million. The new Vermeer case also promises to grab headlines and will be an interesting opportunity to see how far restitution practice has progressed after the messy and protracted stonewalling of the Austrian government over ten years in the Klimt case.